A lot has changed this year in Office 365; the addition of Apps that integrate with each other now gives the user more power of choice. Need to understand what is possible? The first step is understanding capability: as a manager to build that strategy; as an IT person to see where it fits with other technologies and implementations; and as a business person to monitor the impacts on people and how it will be used. This year’s Digital Workplace Conference provides you with THE BEST opportunity to look at the capability of some of these tools in more detail. See them demonstrated, get up close and personal with the experts who are working with clients every day, talk to other companies on the same journey, and learn what is best for YOUR organisation. To make it simple, we have split the sessions below, into the various apps under the Office 365 suite and into business requirements. You have the tools, so what can you do with them? 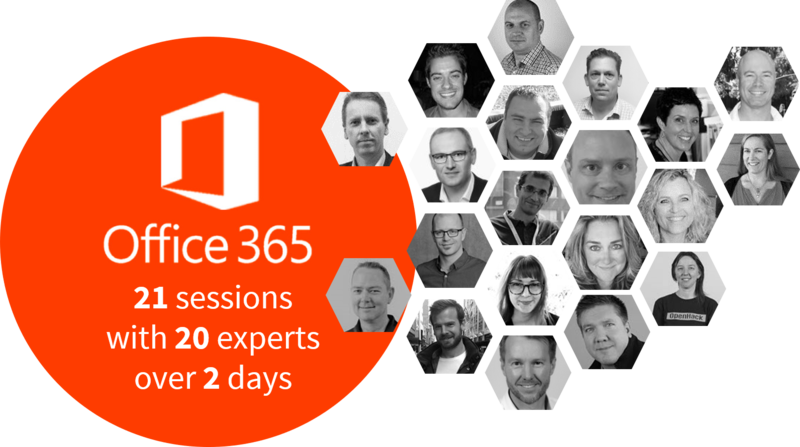 Start here at our pre-conference workshop – Immersion into O365 Productivity Tools with Shannon Donovan. Sample some of the Apps and their capabilities prior to conference then dive deeper by attending a specialised session. POWER BI for reporting, to analyse business data through interactive dashboards and visualisations. ONENOTE to organise electronic notes, personal, meeting, team notes and collaborate with them. PLANNER for organising tasks, assignments and managing projects and progress. POWERAPPS to create workflows and create mobile apps based on content stored in SharePoint, ODFB and other O365 products. STREAM to create video channels for your company to automatically stream content to devices and browsers. SHAREPOINT to build team sites, extranets, intranets and manage documents for your organisation. YAMMER to create enterprise social networking services used for private communication within organisations. TEAMS for team-based conversations and the added functionality of Groups: for Sites, Planner, OneNote, and File Sharing. More Technical Deep Dive for IT Pros.